After years of trying to tame my wild curls I finally have my hair routine nailed. So here’s a walkthrough of the products that are giving me happy hair days, with some tips I’ve picked up along the way. Made with organic coconut oil (and a fair few other oils including organic hemp, jojoba, and olive) my dry, frizzy hair adores this shampoo. You only need a little: about a 50p piece worth works up a lather that covers my long hair and I rarely feel the need to repeat. I’d prefer it didn’t contain sodium coco sulphate (SCS) as the foaming agent/cleanser so I am going to be bringing you some ‘purer’ natural shampoos I’ve been trialling on the blog soon (including Rahua, Weleda, Josh Rosebrook and John Masters Organics). For more info on SCS scroll down to the bottom of this post. However, worth pointing out that even with the SCS this shampoo receives a respectable four on the ThinkDirty app which rates products for toxicity. Tip: When shampooing just lather up your roots. When you rinse, the shampoo will cleanse as it travels down the rest of your hair. Much kinder on dry ends. Not only does it smell of holidays but this super rich conditioner containing organic coconut oil and shea butter makes light work of my unruly tresses and leaves my hair feeling smooth and soft. Perfect for super-knotty, dry ends days. Tip: Leave conditioner in for a minimum of a minute before combing it through. If your hair is very dry don’t over-rinse; a bit of conditioner left on the ends will help keep your hair glossy and frizz free. Available from: I buy Desert Essence from my local Revital Health store but they’re also available online from retailers such as Planet Organic for £8.99 each. 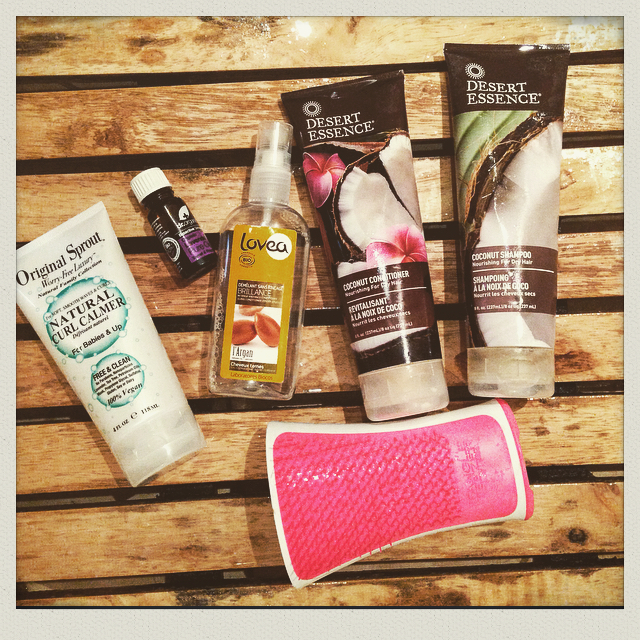 I’ve mentioned this little miracle on the blog before in my post ‘tease those tangles out’. It’s phenomenal and has dramatically reduced the time and pain involved in combing my conditioner through (as I have curls my hair only gets brushed when I wash it so you can imagine what I’m dealing with!). Tip: When combing hair, divide it into sections (even just two will help) and start combing at the ends, never at the top. Work your way up to the roots gently and you’ll protect your hair from stress and breakage. It also hurts less! The name is a bit of a misnomer; far from calming my curls this wonderful styling product gives me beautiful soft locks that last. I comb my hair and then use a generous amount of this cream while it’s still quite wet, working it through from just below the roots to the ends before letting it dry naturally. What’s lovely about this curl cream is that it doesn’t weigh the curls down and the next time you wash your hair you can still feel the moisturising properties coating the hair shaft. It’s cheaper than Aveda’s Be Curly Curl Enhancer and boasts a far better rating on ThinkDirty. Tip: I use curling cream as I’m a product junkie but regular conditioner works almost as well and is very useful when travelling. After your usual wash, comb your hair and then scrunch through a small amount of conditioner paying particular attention to the bottom half and ends and staying away from the roots. This tip is for curly hair only! Available from: I buy for £10.50 through Ocado but LookFantastic.com and BeautyBay.com as well as Original Sprout’s own website are other options. I bought this spray leave-in conditioner with organic argan oil for my little one but it’s so good I stole it off him. Mean mama. I spray a bit on most days just to freshen up my hair and boost my curls. I’ve had a few comments on how good my hair smells since I started using this and it’s great for stubborn tangles. Available from: I bought mine in store at Whole Foods, Kensington but I’ve found it online for £6.49 from Essentials Pharmacy. I’ve written about the wonders of lavender oil before. I use it directly on my sensitive scalp to calm irritation and freshen up between washes.